Putin late to meeting with pope: Francis cools heels. 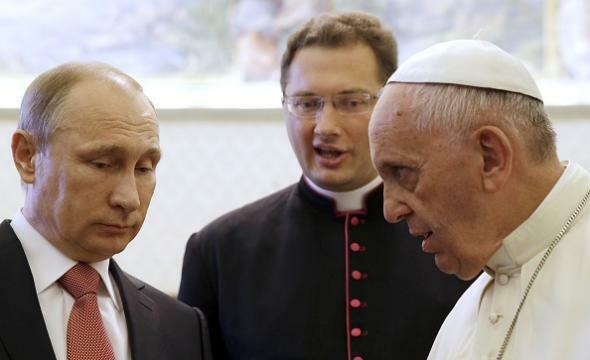 Putin and Francis listen impatiently to someone who felt his perspective was important enough to justify butting into a conversation between Vladimir Putin and the Pope. Russian autocrat Vladimir Putin is in Italy. In addition to meeting with the Italian prime minister and subsequntly criticizing the economic sanctions that the West has levied against Russia, Putin also met with the pope—but showed up an hour late. The Russian leader arrived at the Vatican late Wednesday afternoon for a meeting with Pope Francis – an hour behind schedule – for discussions in which the situation in Ukraine, the reason for the international imposition of economic sanctions against Russia, will likely be a topic of conversation. The Russian president was 50 minutes late to meet the Pope on Monday. Putin was probably just in a salty mood because BP announced Wednesday that the United States has surpassed Russia as the world’s top oil and gas producer. Say what you will about the United States (e.g., “the United States is an increasingly class-stratified nation with deep racial problems and a recent history of disastrous foreign policy”), we know how to keep that oil pumping and we don’t disrespect the pope’s schedule.